Action Bank by Barcrest kind of makes you think of a fast paced money heist. It's a 5 reel, 20 payline slot with a simple bricks and mortar looking theme. It does have that classic appeal, but there’s a touch of the modern thanks to its creative bonus feature which has been discussed below. Click here now to discover more online slots. Action Bank has a very basic design- there aren’t any cool graphics, just a redundant colour scheme of grey, black and red. It takes you back to the days of arcade gaming as it looks a lot like the machines used to play back then. Discover more with Wizard Slots. The slot has 3 basic symbols only i.e. the ‘Bar’, the big red ‘7’ and a large ‘X’. The white circle symbols don't earn you anything, but can help you activate the slot's bonus feature. · Wild symbol -The wild is represented by the joker. It can replace all the other symbols except the scatter symbol. · Scatter symbol -The scatter symbol is represented by the golden vault which triggers the slot's one and only main feature. · Free Spins -The white circle symbols can transform into golden vault symbols. If 5 land on the same spin, this feature is activated. Once the spins start, players will be asked to choose one of the vaults for a chance to win anywhere from 5 to 30 free spins. Before the spins start, you will have a chance to enter the gamble round to try and raise your number of spins (maximum 30), but it's tricky because you can also lose them all. The spins will then occur with some double symbols added onto the reels which enables longer paylines and in turn bigger wins. The spins can be re-activated when 5 more golden vault scatters land during the spins. · Big Bank bonus -You can also possible trigger the Big Bank bonus randomly. It's essentially a picking round that offers 3 multipliers – sapphire, diamond and ruby. You can win up to 500x in this feature. Barcrest has a long history in the iGaming industry. The company was established all the way back in 1968 in the UK. At one point in time, all the slots in British casinos and pubs were owned by Barcrest. The company dominated the 70’s, 80s and 90’s- times when online gaming was a far-fetched idea. Barcrest was sold to IGT in 1998, and later to Scientific Games in 2011. For a company that was highly active in the 70s, you'd wonder how they are managing to release relevant slots today. The company has managed to keep up with the times and deliver some pretty solid slots like the famous Rainbow Riches and its sequels as well as Ooh Aah Dracula, these slots have been played millions of times. Follow this link to discover the top 10 best uk slots today. 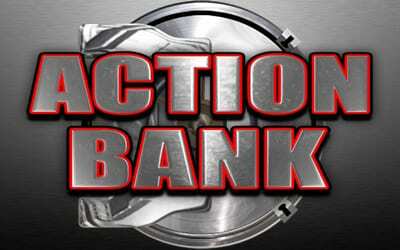 Action Bank provides good, enjoyable fun as it combines aspects of the traditional and a touch of the modern. It's definitely one of those slots that sneaks up and surprises you. It's got some up-to-date features which can be quite profitable if you’re lucky. Give it a spin and enjoy the RTP % of 95.16%. If you like this game, why not also try 20p Roulette?